Getting a cavity is never anyone’s idea of fun. 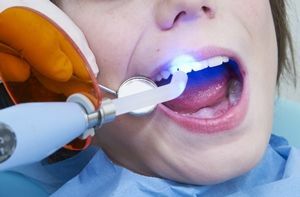 Having the cavity drilled and filled can also be an experience that is less then pleasant but it is what needs to be done when you find one of those spots of decay. Some people have reported that after they have a filling or a replacement filling they get some tooth sensitivity issues. Often times this sensitivity happens for a couple of reasons. If the cavity was a particularly deep one it may have exposed some of the root and that will cause issues with how your teeth react to hot and cold and even when you chew. Hopefully your dentist used a kind of liner before putting in the filling but if they didn’t and the issue persists you may need to have it redone. Also if you got the cavity from a weakening of the enamel you may need to speak to your dentist about what you can do to strengthen and help the enamel to be better. One remedy to do before you get in is to start using enamel strengthening for sensitive teeth toothpaste right away. Oftentimes patients who have a filling pulled out and redone will notice more swelling then others and that swelling can cause sensitivity as well. If you still have issues after the swelling goes down you need to contact your dentist. The normal sensitivity issues after a filling will depend on how long it takes you to heal, some people take longer to heal then others. The average will be about 7-10 days with some having shorter healing times and some having longer times. The type of filling material can have an effect on sensitivity as well with a silver material or gold being more likely to have issues that cause sensitivity (especially with cold; or air, pressure, etc) then some of the resin compounds.